We make sure that all our HP cartridges and Inks are of the highest quality, whether 100% authentic or fully HP compatible. Our wide range of HP Inks, including compatible or genuine HP 88XL Ink Cartridges are available at unbeatable prices, and we save you even more money with our completely free delivery service on all your cartridge and ink purchases. Whatever the size or scale of your printing needs, we can help you keep your replacement cartridge costs down and make printing more affordable. 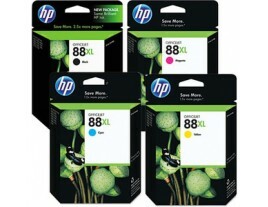 Find out just how much we could save you today on HP 88 XL Multipack Ink.